Revolution Counselling offers specialist counselling support for people who realise that they, or significant other in their life is gay, lesbian, bisexual, transgendered or questioning a process frequently referred to as 'coming out') or for LGBT couples in a difficult relationship. Initial feelings may be of shock, confusion, anger, betrayal, sadness, grief, numbness, to name a few. 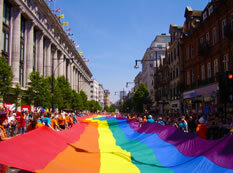 I have trained with Pink Therapy in London and completed their comprehensive Essentials In Sexual Minority Therapy course to ensure I understand the needs and requirements of my LGBTQ clients and offer Affirmative Therapy. When a loved one 'comes out' whilst in (often a heterosexual) relationship, or decides that being 'out' isn't something they want anymore, it can have a devastating effect on the partner/loved one who may have shared a significant amount of time, space, emotion, love, children, life, finances, etc., with them. There is never really a right or wrong time for anyone to make such important and often life-changing decision. Often, coming out is almost an 'end process' of a lifetimes worth of self doubt, self questioning, confusion, repulsion, fear, to name a few, for an individual who may have been questioning their sexuality. Be assured that your loved one has not made this decision lightly, nor to hurt you - even though it may have done just that. People, both those who have dislosed their sexuality and those affected by the disclosure are often left with many questions and feelings that may be overwhelming. It is important to have time for yourself to explore your own thoughts and reactions to the whole situation. People will have knee-jerk reactions that cause pain and anxiety, the individual disclosing will feel overwhelmed by opposing feelings of sadness for their loved ones and guilt about finally allowing themselves to live their truth and be free. It is essential at this time to have time and space and where possible positive support from friends and family. Be prepared that they may push against your decision, threaten you with withdrawal of their love, denying access to children and beloved pets (yes it happens). Whatever the outcome, the most important thing is to be safe and have an opportunity to explore your feelings, thoughts and possible actions with someone who understands and can offer support. No it is not. Initially your feelings towards yourself if you are coming out, your LGBT partner/loved one may be harsh and punitive. You may not feel like understanding, no doubt you will have many questions that may need answering. However, do keep in mind that whilst you are angry and hurting, your partner/loved one is too. They may feel equally helpless in trying to balance their own needs with trying to offer you support. It is sometimes helpful to think of the courage and trust it has taken your partner/loved one to trust you enough to tell you the truth. Think perhaps of the reason why it might have taken them this long to tell you in the first place. Many reactions abound on coming out, both from you and those around you for example: my life is ruined!, how will I face my family?, what will I tell our children?, what will the neighbours think? I'm too old for this! and so forth. It may very well feel as if this is the end of the world as you have known it. However, the pain you are feeling will eventually subside - it is not going to be an easy journey for either of you. The most important thing is that you both allow space to talk through your feelings with each other, consider professional support where you can both have time and space to talk. I can offer you the choice of individual or couple counselling where you can explore your feelings in greater depth and find understanding and clarity. It may be useful to have therapy individually so YOU can explore what is going on for you before considering joint support. It may be prudent, if appropriate, for your partner or significant other to have their own therapeutic support so that they can understand what is going on too. Remember, you are NOT alone in this, and more importantly, things WILL get better - it just takes a little time. If you would like to talk, then please get in touch to book an appointment to explore your feelings further via the contacts page.